Watch this webinar to learn about an online training option from the Center for Educational Leadership. Webinar participants will learn why Stage I training is essential to a district’s successful implementation of a teacher evaluation system, what Stage I Online Training is and how it compares to CEL’s expert-led on-site Stage I training, and what the different uses are for Stage I Online Training. District personnel responsible for training and staff development. State and district personnel responsible for selecting teacher evaluation models. 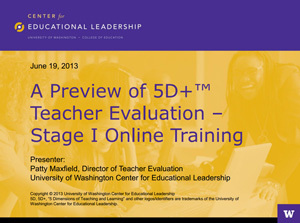 Anyone interested in learning more about CEL’s 5D+ teacher evaluation training. 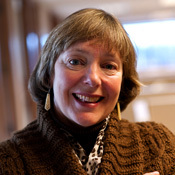 As director of teacher evaluation for the University of Washington Center for Educational Leadership (CEL), Patty Maxfield supports district partnerships by providing instructional and leadership coaching connected to CEL’s 5 Dimensions of Teaching and Learning™ instructional framework and the 5D+ Teacher Evaluation Rubric. Patty has been involved with public education for more than 30 years as a teacher, teacher leader, facilitator and administrator. 5D, 5D+, “5 Dimensions of Teaching and Learning” and other logos/identifiers are trademarks of the University of Washington Center for Educational Leadership.